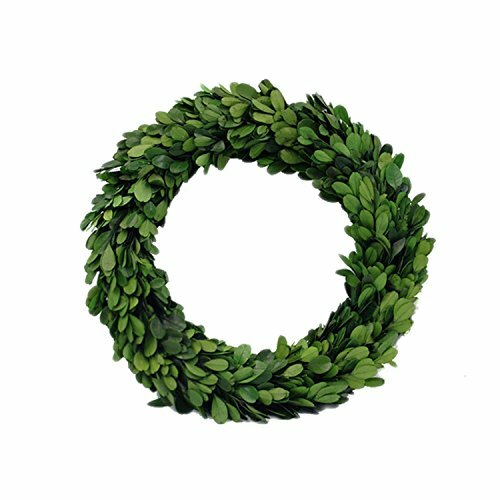 If you are looking for that special, attractive decorative boxwood wreath without having to buy a new wreath each season, the D.Jacware wreath is your choice! If you have any questions about our products, please feel free to contact us. We'll be always ready to offer best service for you! 【Handmade】Boxwood wreath is trimmed by hand and make it traditional round shape. This wreath measures 10" in diameter and 2" deep created on a iron wreath frame. 【Multipurpose】Wreath can be displayed on doors, walls and windows in indoor or covered outdoor locations. Perfect for decorating weddings,stages,parlours,bedrooms,offices,hotel,dining rooms,birthdays, stores private club and so on. 【Beautify】A beautiful decoration for Christmas, add atmosphere for festive. The Boxwood garland is perfect gift no matter if it is a housewarming Christmas gift for your favorite someone. If you have any questions about this product by D.Jacware, contact us by completing and submitting the form below. If you are looking for a specif part number, please include it with your message.